Mysore, officially known as Mysuru and renowned as the City of Palaces is the city located in the state of Karnataka. It is the city with a lot of history backing its roots to the centuries while hosting some of the oldest and most popular palaces of Old India. The weather and tranquility here make it an ideal destination for a vacation. Mysore is popular tourist destination and a perfect weekend getaway to visit anytime of the year. Since you are visiting a city of Palaces, you will probably want to cover all the palaces it is famous for and got its name from, so visiting the city in the month months of October to February would be the best time of the year. At this time of the year, the weather is quite favorable and cool dipping in a minimum of 10 degrees. December is considered to be the coldest of all, making it a perfect destination for those on honeymoon as well as the ones who seek solitude and tranquility away from the hustle. When you plan to visit Mysore, 4 days prior to Dussehra would be the ideal season to watch the celebrations. During this season, Mysore attracts the tourists from all over the globe. The rich heritage city of Mysore is at its dazzling best during the Navaratri Utsav season. Mysore has sophisticated highway networks making it easier for people from neighboring states to travel easily in a car or a bus. If you are traveling from Bangalore, then the road journey to Mysore will take around 3-4 hours to reach the destination. Mysore is well connected by trains and is located at a distance of 2 km from the center of the city. The Mysore Railway station has many direct trains connecting to the major cities of India like Hyderabad, Bangalore, Mumbai, Kolkata, and Chennai. It is an incredibly breathtaking and extraordinary example of the Indo-Saracenic style of architecture and is the second most magnificent edifice monument visited by the locals and Tourists after Taj Mahal. This palace is renowned for its light and sound show and also for its Dussehra celebrations. Take Away: Photography is not allowed inside the palace, and in case of any information collection, the audio information kits are available in 7-8 languages. The lush green terrace gardens and prolific plants are endless and the abundance of beauty will give you a soul-soothing site. Spreading over the area of 60 acres, the gardens make you feel overwhelmed with its charming rose gardens and flowerbeds. The garden is open to the Public from 6.30 a.m. to 9.00 p.m.
Monday to Friday 7.00 to 7.55 p.m. 6.30 to 7.30 p.m.
Saturday to Sunday 7.00 to 8.55 p.m. 6.30 to 8.30 p.m.
Take Away: Use of a camera is not allowed, and the visitors will be fined for violating rules. The gardens are illuminated on a regular basis on Wednesday, Saturday and Sunday at 7 P.M. Have an entertaining evening watching the well-synchronized and lively fountain show, which is completely a stress-buster. Boating in the tranquility of Cauvery is another way of rejuvenating your mood. All this makes the Brindavan Gardens a perfect place to rewind and have ultimate fun with family and friends. The Mysore zoo is one of the best zoological Park in India. Its meticulous design is responsible for making it a special zoological garden. It tends to create a natural habitat for the animals from big to small, aquatic to terrestrial and primates to reptiles. Here, in the Mysore Zoo was the first cesarean section delivery performed on an elephant that gave it a global fame. Timings – 8:30 am – 5:30 pm (Wednesday to Monday), remains closed on Tuesdays. Cost – The visitors can get their tickets booked online on the Mysore Zoo booking portal. On Weekends and Government Holidays: Adults – INR 60/- per head, Children (between 5 to 12 yrs) – INR 30/- per head. The visitors will have to pay separately for the vehicles and extra amount is charged if the time exceeds four hours. Carrying a camera will require you to pay the amount of INR 150/- and for Still camera INR 20/- is chargeable. The Mysore Zoo Safari is another way you can explore the beauty of the Zoo’s flora and fauna. Electric vehicles are available for the same for which the adults are charged INR 125/-, children (5-12) – INR 75/- and senior citizens are charged INR 75/-. Take Away: If you are visiting with the elderly people, then it is advised to reach early to make bookings for the vehicles and resting chairs. Follow the signboards to make sure you don’t miss out anything. Plastic bottles aren’t allowed inside the park but there are RO purifiers set up at every 100 meters. The St. Philomena’s church is the second tallest church in Asia and is one of the most important historical sites in Mysore often visited by tourists and foreigners. The church is very beautiful and is one of the most distinctive landmarks of the city. The evening sky makes it look all the more beautiful with a panoramic view you can’t miss, when in Mysore. Take Away: Photography isn’t allowed inside the church. The holy mass is conducted every morning and evening in the church and an annual feast is organized on 11th of August every year. The Chamundeshwari temple is one of the oldest temples in the City of Palaces, Mysore and is another must-visit attraction for the tourists. 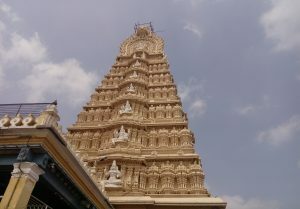 The temple is famous for exhibiting an exhilarating view of Mysore. It’s beautiful and magnificent architecture is highly admired by the people from across the globe. Cost- Free. 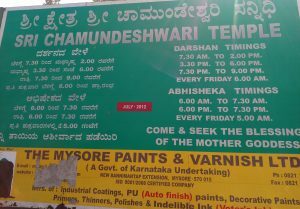 If you want to quick darshan, they are special passes for this. 6 a.m. to 7.30 a.m and 6 p.m to 7.30 p.m.
Friday 5 a.m to 6.30 a.m.
Dasoha (free meals) is arranged to devotees daily. Morning 7.30 a.m to 10.00 a.m, Lunch 12.00 p.m to 3.30 p.m. and Evening 7.30 p.m to 9.00 p.m. It is an amusement and water park that serves as a perfect picnic spot. It is set amidst the lush green forest environment of Mysore-Bangalore highway. The GRS Fantasy Park is a theme-based amusement park and is one of the favorites among the locals of Mysore. It offers numerous really amusing and fun rides and activities as well, making it a perfect spot to hang out with friends and family. Senior citizens (above 65 yrs) – INR 449/-. Take Away: Follow the guidelines and instructions properly and carefully before taking any water ride or adventurous ride. Eatables are not allowed inside the park. This Palace is a spectacular edifice that is situated in the majestic city of Mysore and has an illustrious history attached to its name. Now, this palace has been converted into a magnificent art if gallery and hosts some of the exquisite pieces of artwork. So, visit this place and uncover the interesting history of this palace and more. Take Away: A historical palace with a deep history back to the centuries displayed in the paintings and murals of the palace architecture will simply leave you stunned. Folklore Museum is a part of Mysore University and is a home to one of the most beautiful and elaborate collections of folk artwork, products, and articles. Witness the most sprawling depictions of the state’s folk art here in this museum. Cost – INR 15 /- per head (Adults), INR 5/- per head (Children). Nanjangud, a tranquil town in Mysore lies on the banks or river Kapila. The region is popular for a variety of bananas grown and the temple here is built in the Dravidian style. Take Away: Carry a camera, torchlight, snacks, beverages, water along and also wear proper footwear and fully covered clothes to sustain the cold in this region. The Bonsai Garden is one of the unique attractions in the royal city of Mysore and is home to 100 different varieties of Bonsai spread across the vast estate. The garden hosts’ 450 miniature trees over an area of 4 acres filled with quirky dwarf trees. The Bonsai garden has a placement of Buddha statues and monkey statues in places representing the Zen culture from where the Bonsai culture has evolved. The beauty of the garden is the stream that flows within it. Take Away: The garden is indeed a delight to walk, admiring the fine art of shaping a 100-year old tree in a terracotta pot. 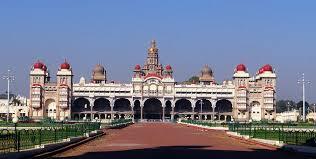 The Lalitha Mahal is recognized as the second largest Palace in the city of Palaces, Mysore. It was built in the year 1921 at the orders of Maharaja Krishna Wodeyar IV of Mysore, for the purpose of stay of the then Viceroy of India in Mysore. The architecture and design of the Palace are inspired by the St. Paul Cathedral in London, and this makes it one of the most remarkable structure to grace the city with. The Mysore Rail museum basically depicts the journey and development of the Indian Railways through the collection of photographs and other articles. Through the plethora of information and insight into the railway engine, the Mysore rail museum is the second of its kind after the National Railway Museum in Delhi. Timings – 10:00 am – 5:30 pm (Tuesday – Sunday) remains closed on Mondays. Cost – Adults INR 15/-, Children INR 10/-, Still Camera INR 20/-, Video Camera INR30/- and Toy train ride – INR 10/- per head. Srirangapatna is a city of both historical and cultural importance. The region encompasses the Tipu Sultan Palace, Gol Gumbaz, Ranganatahswamy temple and many other marvelous must-visit monuments that reflect the ancient Indian tradition and culture. Distance – 22 km from Mysore. Ranganatitu Bird Sanctuary is the largest bird sanctuary in Karnataka and comprises of six islands on the banks of Cauvery. 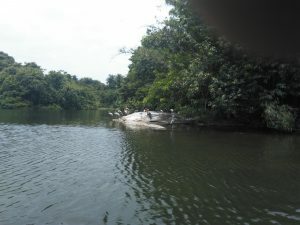 The scenery of the local vegetation and colorful variety of wildlife makes it a unique learning experience. The beauty that finds a place in this bird sanctuary is a sight to sore your eyes with. Take Away: The destination offers a lot of activities to the tourists that include boating, bird watching, and old nature photography..
Hosting several renowned palaces and admirable architectures, the city is a treat for the history lovers and not only is it for the history lovers, but the city makes it accentuate for nature and photography lovers as well with the lush green bird sanctuaries and flower bed gardens. Mysore is a must-have on the destination checklist for those who admire royal and majestic beauty. So, head your way to this City of Palaces and treat yourself with some royalty and highness.